The following is a list of beaches managed by the Falmouth Beach Committee (508-548-8623). During the summer season, each location is staffed with lifeguards, and swim lessons are offered. All are handicapped accessible unless otherwise noted. More information at Beach Department Page of Falmouth town website. 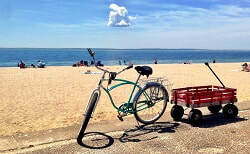 BRISTOL: This beach, located in “Falmouth Heights” neighborhood, has plenty of parking and beautiful views. 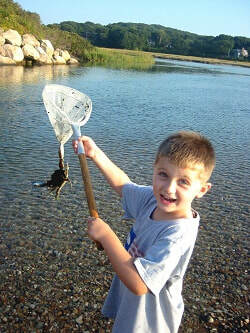 A small creek, which ebbs and flows between Little Pond and Vineyard Sound, is a great place for youngsters to attempt to catch sea creatures caught in the tidal surge. Beach sticker required for parking. CHAPOQUOIT: This location is a favorite of many families. White sand and beautiful open ocean views greet beachgoers, while windsurfers are welcome on the north end of the beach. Beach sticker required for parking. Ideal for sunset. GREW’S POND: Located in Goodwill Park off Gifford Street, this is a fresh water pond staffed by lifeguards. 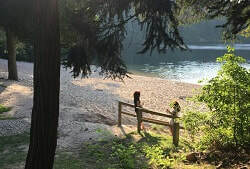 Grew’s Pond boasts a nice sandy beach. Grills and picnic benches are available, and a covered pavilion provides shelter. No sticker required. FALMOUTH HEIGHTS: The beach at Falmouth Heights on Vineyard Sound is long and boasts plenty of beautiful sand. The water is warm and views of Martha’s Vineyard are outstanding. A new wheelchair ramp allows for handicap accessibility from the sea wall to the beach. A beach sticker is required and parking is limited. MEGANSETT: This beach is located along the shores of Buzzards Bay. Frequented primarily by neighborhood families, Megansett is a great location for viewing a sunset. A beach sticker is required and parking is limited. 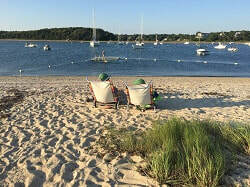 MENAUHANT: Located on Vineyard Sound, this is the longest beach in Falmouth, and is divided into an east side and a west side by a tidal stream that connects Bournes Pond to Vineyard Sound. Beach sticker required or a one-day fee of $10 can be paid to the gate attendant for parking. 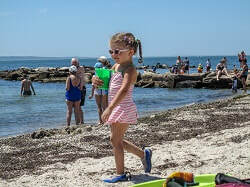 OLD SILVER: This beach is by far one of the most popular on the Cape. The parking lots are divided into two sections: one for residents and one for the public, which is accessed by paying a daily entry fee of $20. Concessions, showers and changing rooms are available. People come from great distances to enjoy Old Silver’s pure white sand. Parking is ample, but come early; the lots fill up fast on hot summer days. STONY: Located in Woods Hole Village, this MBL owned beach is staffed by Falmouth lifeguards and parking attendants. It is a wonderful beach, sheltered from the afternoon southwest winds and highly utilized, so arrive early. A Falmouth beach sticker or MBL sticker is required to use the limited parking area. SURF DRIVE: Located on Surf Drive, a short walk from Falmouth’s Main Street, this beach features public showers and a concession stand. The Ellen T. Mitchell Bathhouse, where residents and visitors may purchase Falmouth Beach Parking Stickers, is located here. Surf Drive Beach faces Martha’s Vineyard and is a part of Vineyard Sound. Beach sticker required or a one-day parking fee of $15 ($10 at Mill Road lot) can be paid at the gate. WOOD NECK: This beach is blessed with a tidal creek containing pure sand and many “critters;” a popular combination for active youngsters. Beach sticker required for parking.